Charcot neuroarthropathy is a debilitating disease, which affects nearly a third of diabetic patients with peripheral neuropathy. Many of these cases result in below knee amputation due to secondary complications associated with this condition such as chronic ulceration with subsequent soft tissue infection and osteomyelitis. 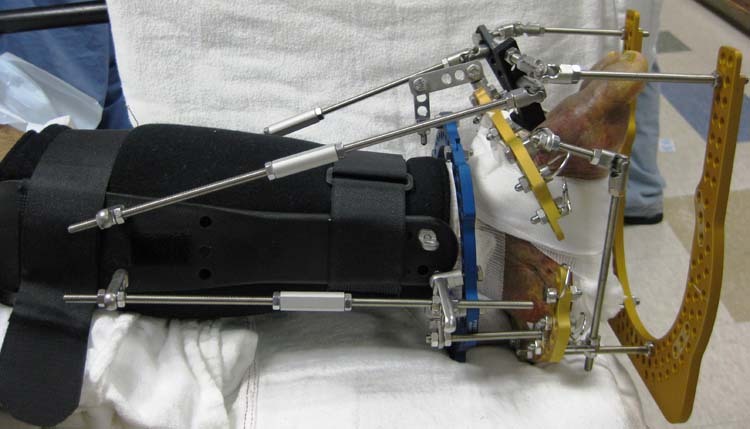 Previous studies have shown the effectiveness of utilizing external fixation and medial column arthrodesis to achieve a stable plantar grade foot in patients with Charcot neuroarthropathy. 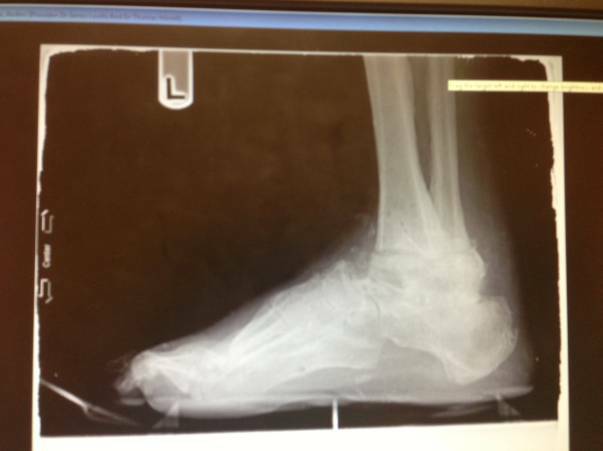 In this case we present a patient who has a complex deformity due to a previously shortened and hyper-mobile 1st ray combined with an ankle and forefoot valgus deformity. 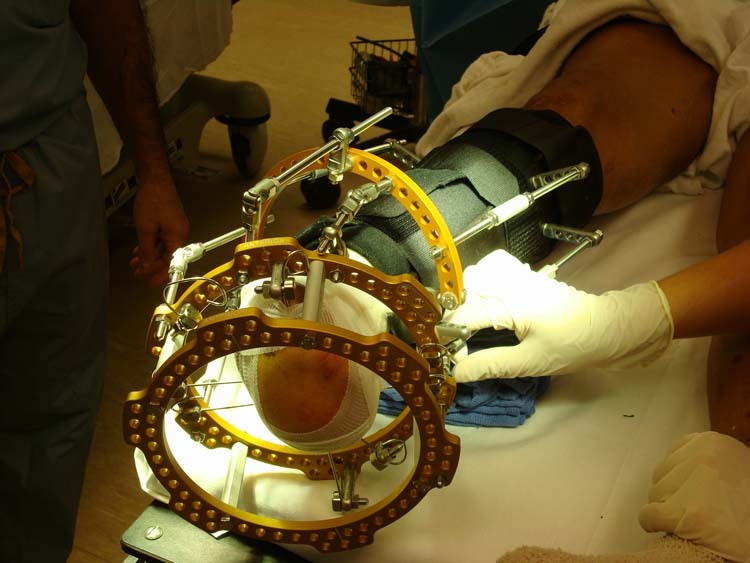 Through the utilization of previous modalities combined with restoration of 1st ray length, a stable plantar grade foot was achieved preventing below knee amputation. Key words: Charcot Foot, Limb Salvage, Medial Column Lengthening. Charcot neuroarthropathy is a progressive condition that results in the destruction of single or multiple joints characterized by subluxation, dislocation, and osseous destruction. 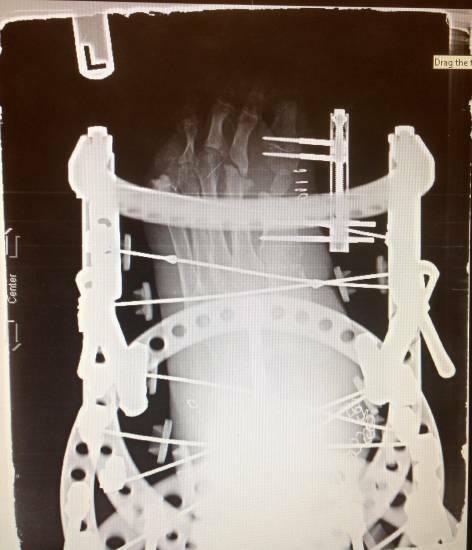 Eventually, the Charcot process proves to be self-limiting and enters a quiescent phase, leaving the patient with an irreversible condition, in addition to an increased risk for secondary ulceration. Complicated by peripheral neuropathy, the syndrome historically left the affected individual with the loss of the affected limb. Pathogenesis is related to stress induced repetitive micro-trauma or acute injury on the affected lower extremity that has a loss of protective sensation. 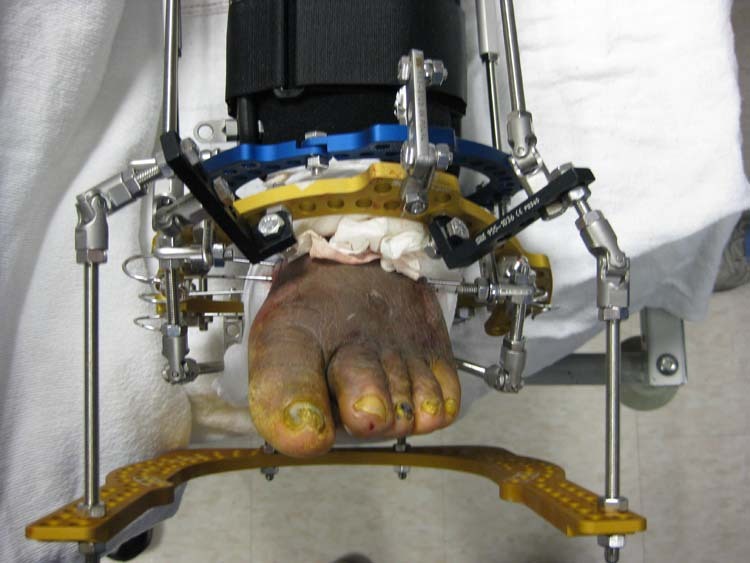 Because of a traditional understanding that management of Charcot neuroarthropathy often resulted in non-practical ambulation, in the past many surgeons would choose to perform an amputation. Charcot affects only 1% of diabetics, however it has been reported in a staggering 29% of diabetic patients with peripheral neuropathy and loss of protective sensation. Take into mind that the survival rates for diabetic amputations at 5 years is only 50%, and it becomes evident that a need for alternative treatment modalities is high in demand. 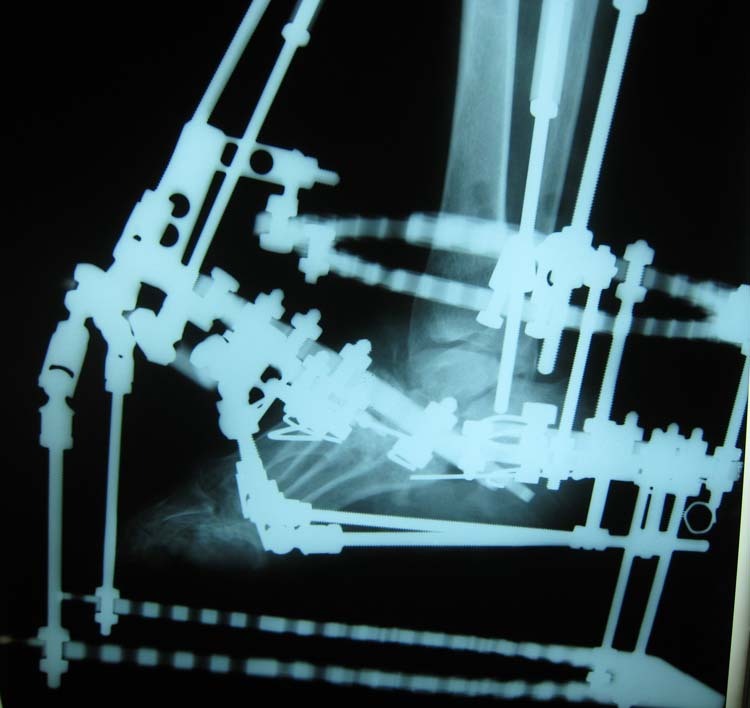 Today, an increasing number of surgeons are advocating for earlier intervention of Charcot changes. 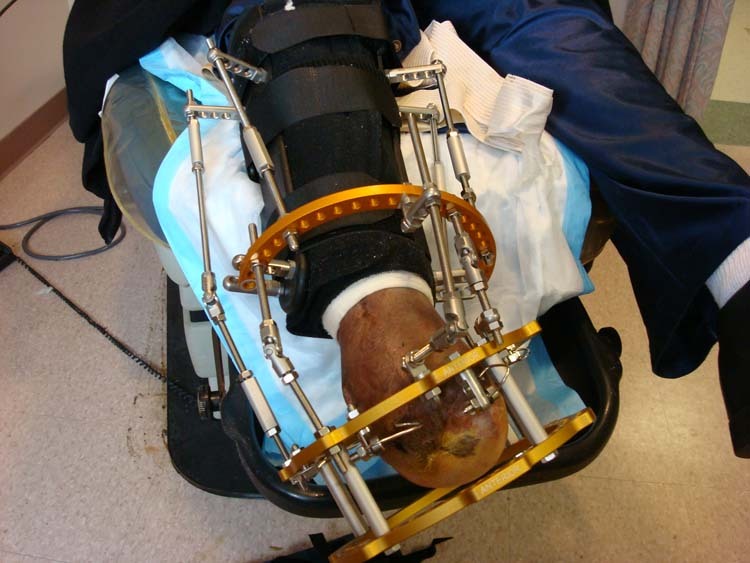 To reinforce the concept that increased surgical intervention is needed, we present a case in which below the knee amputation was prevented through the use of an autologous bone grafted 1st ray, external fixation and tri-planar deformity correction. 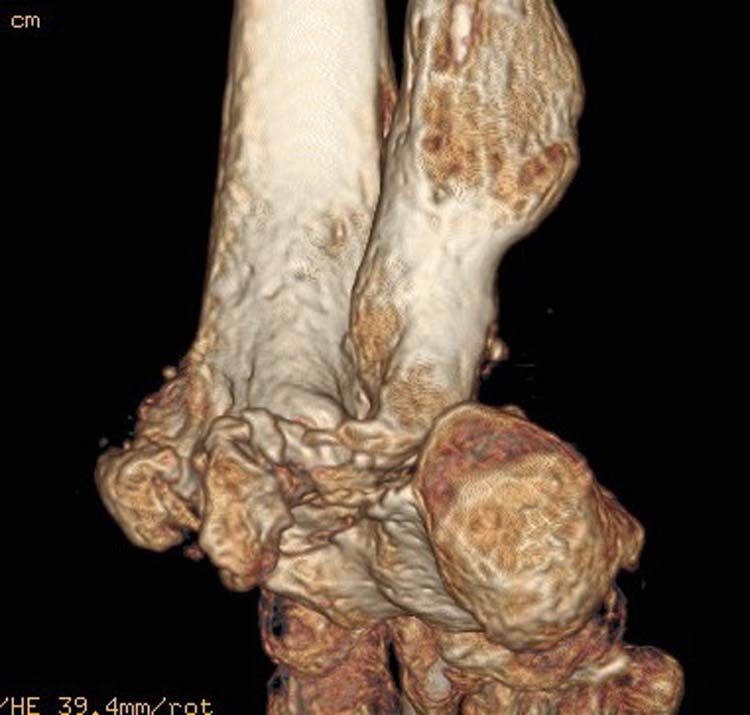 A 56-year-old male with a history of diabetes and Charcot joint disease presented with a chief complaint of left foot deformity with severe pain on weight bearing due to pressure under the medial malleolus and medial plantar foot ulcer. 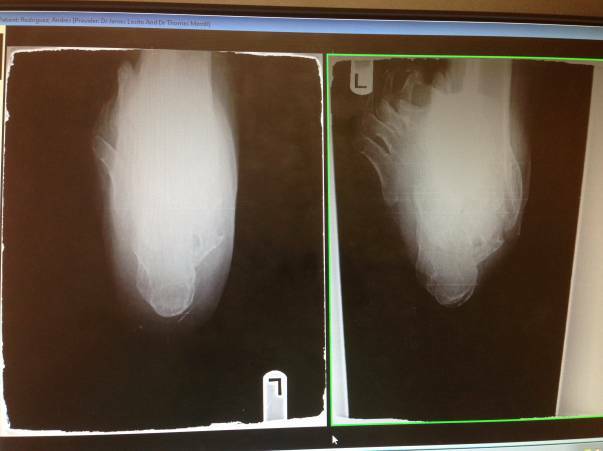 The patient had a previous left 1st metatarsal head resection due to chronic osteomyelitis. When the patient initially presented to the Mercy Emergency Department on June 4, 2012, a malodorous, purulent draining ulcer was noted to the left 1st metatarsophalangeal joint with a total area measuring 2.5 cm. The patient was noted to be completely neuropathic. The left foot and ankle were noted to be in severe valgus position, and the 1st metatarsophalangeal joint (MPJ) was dislocated. 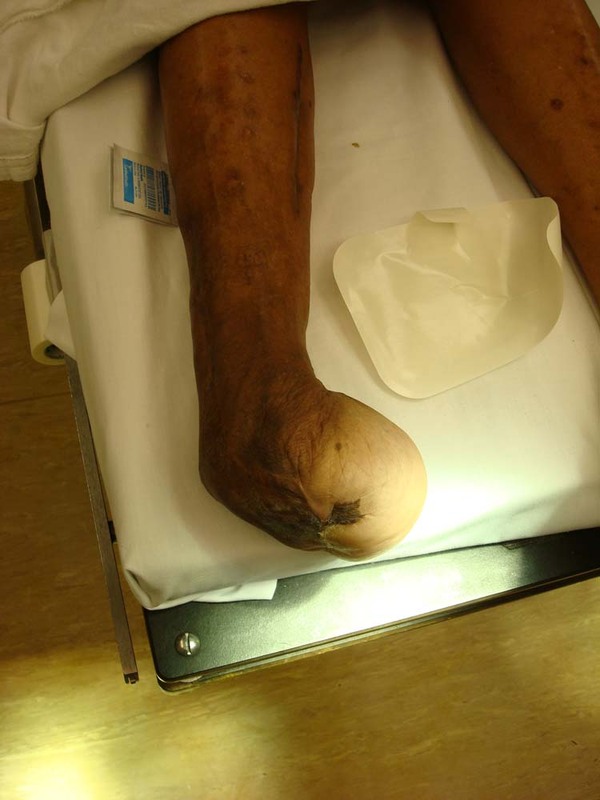 Infectious disease consults recommended a below knee amputation due to the extent and chronic nature of the condition. However, following podiatry consult, serial incision and drainages (I&D’s) with IV antibiotics, and future limb salvage reconstructive surgery was recommended upon infection control. 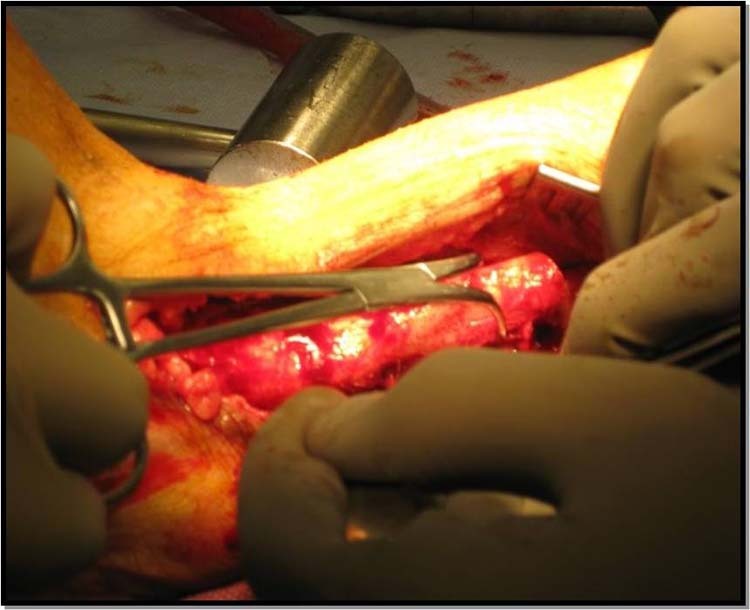 In the period between June 2012 through to November 2012, six successful I&D’s with bone debridements were performed, resulting in control of infection. 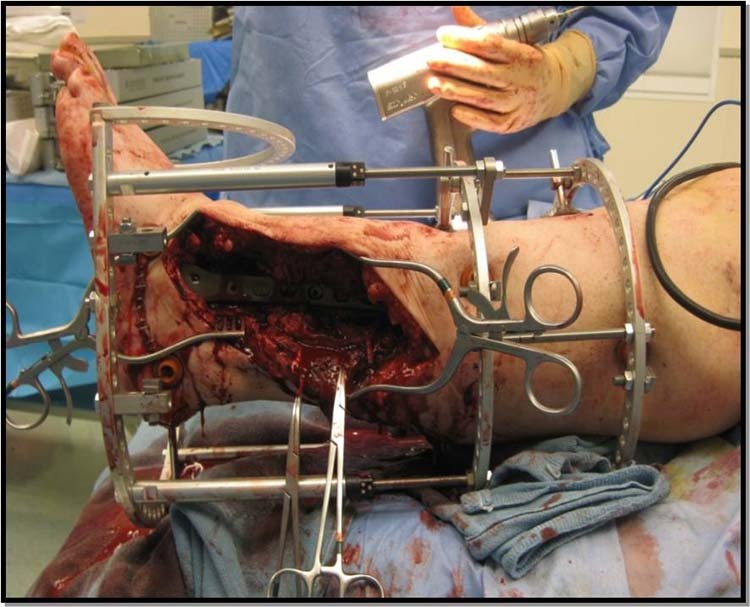 At that time, a decision was made to attempt to reconstruct the patient’s left lower extremity utilizing an external fixation frame. 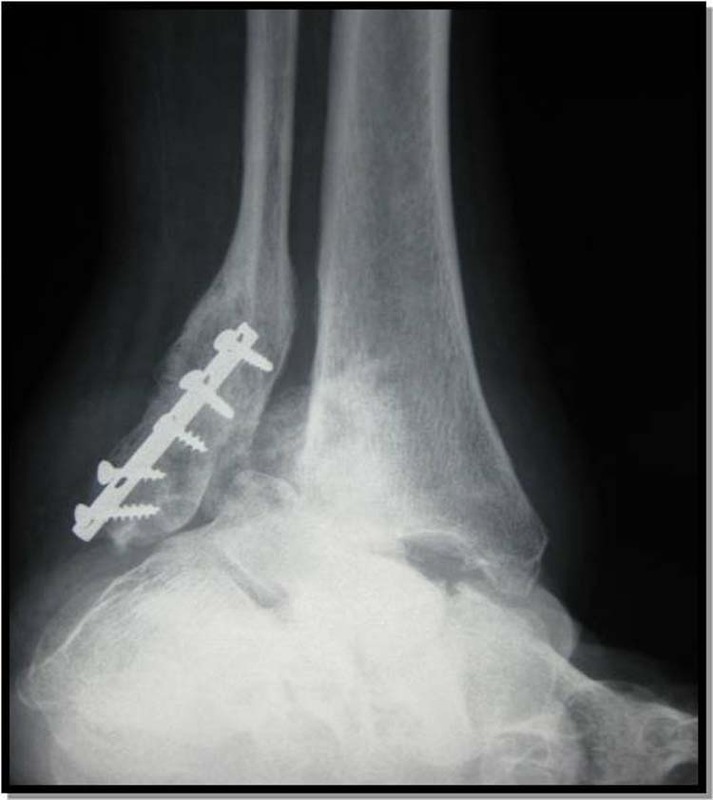 On November 18, 2012, the patient was brought to the Mercy Operating Room for surgical correction of left Charcot joint disease. 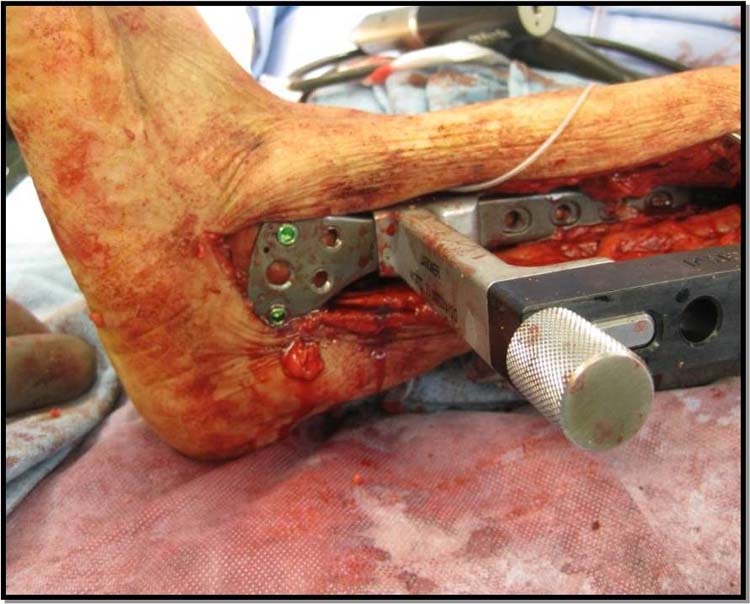 After general anesthesia was induced, attention was directed to the medial malleolus where a sagittal saw and blade was used to shave down all hypertrophic bone. A transverse cut from posterior to anterior was made with an osteotome and mallet on the medial malleolus to create a varus wedge. 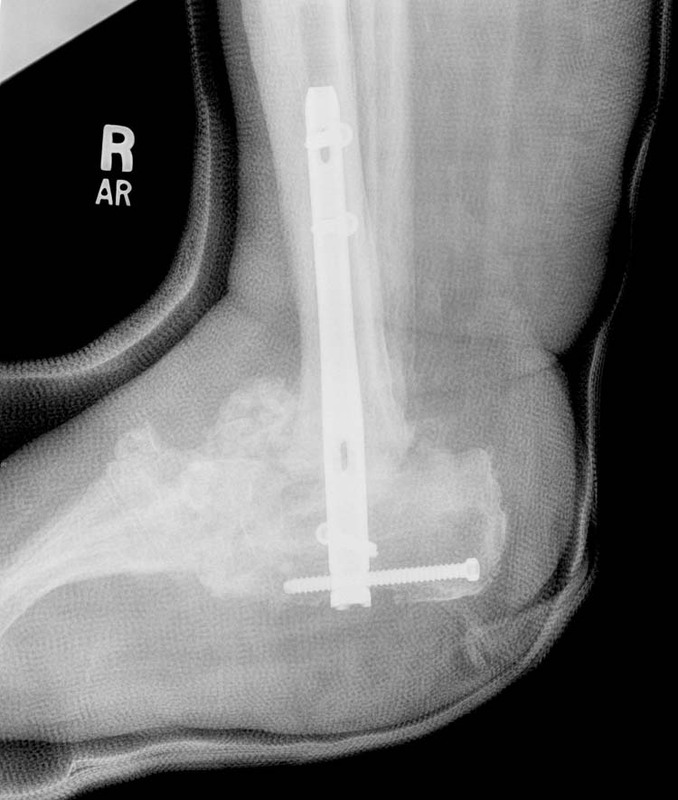 The wedge on the medial malleolus was closed for the left tibial correctional osteotomy. Figure 1 Left: Postoperative lateral radiograph showing bone graft placement, as well as, 1st ray extended length Right: Preoperative lateral radiograph showing shortened 1st ray. Next, all cartilage was removed from the ankle in preparation for fusion. 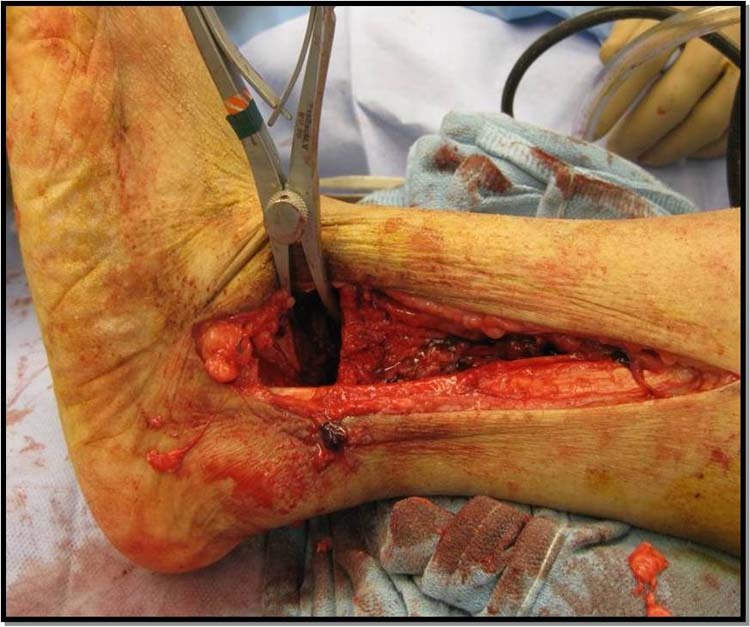 Autograft and allograft (Trinity Evolution) was applied to the ankle fusion site and the ankle varus wedge. Attention was then directed to the first MPJ, where all chronicity of the joint was resected, and the bones were fenestrated for fusion of the first MPJ. Autograft measuring 12.8mm x 8.5mm. (Fig. 1) taken from the tibial varus wedge osteotomy was introduced into the site to facilitate fusion, and restore length to the 1st metatarsal. An Orthofix MiniRail was applied to the 1st MPJ. 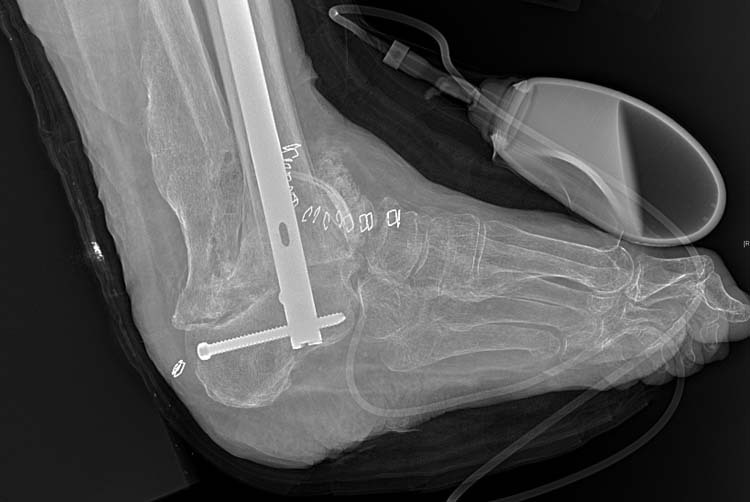 Figure 2 Top: Dorso plantar intra-operative radiograph showing placement of external fixator and monorail. Bottom: Lateral intra-operative radiograph showing placement of external fixator. The ring external fixator consisted of 2 circular rings and 2 foot plates. 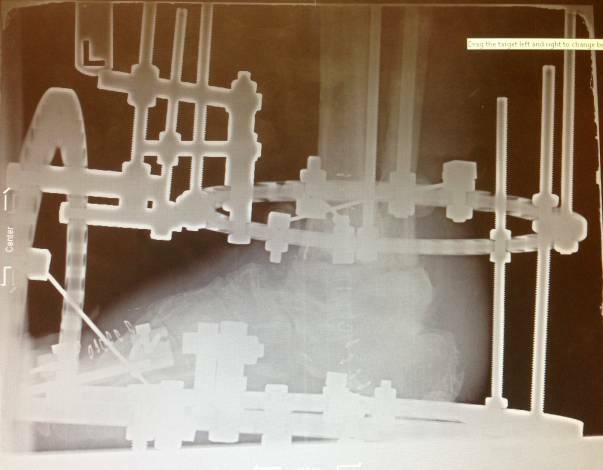 The case progressed successfully to wound healing and primary fusion after 10 weeks. 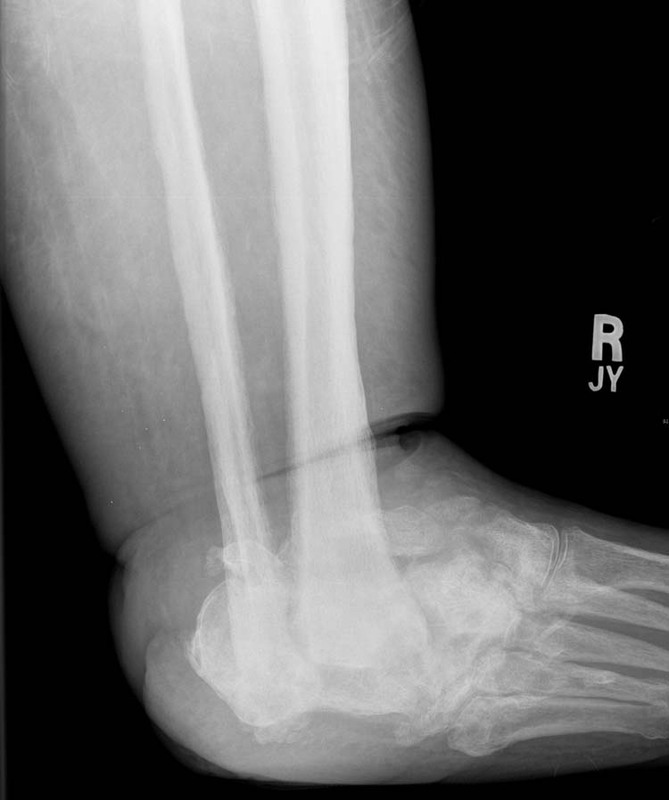 Figure 3 Top: Postoperative radiographs showing removal of hypertrophic bone formation as well as fusion of ankle joint. Bottom: Preoperative radiographs showing hypertrophic bone formation. In follow-up visits, the patient states he is able to ambulate pain free and without assistance. 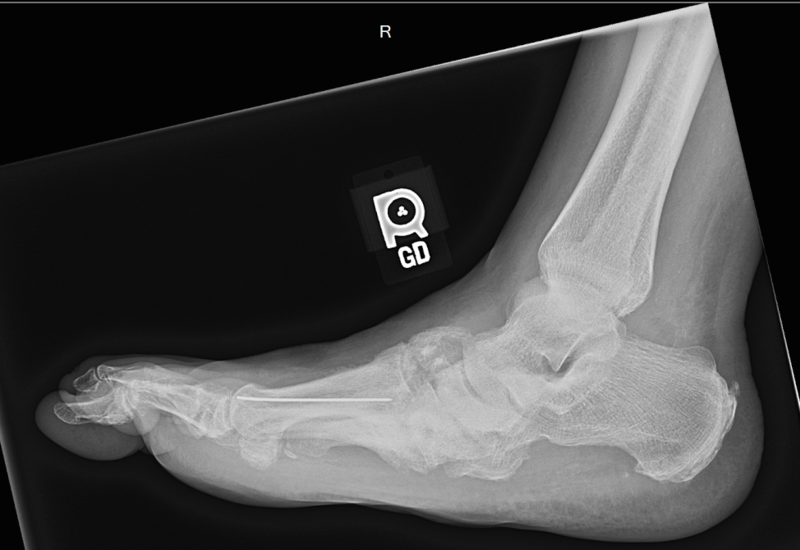 Post-operative x-rays reveal fusion of the ankle joint (Figure 3), and correction of valgus deformity (Fig. 4) as well as fusion of the 1st MPJ with achievement of a more accurate length of the 1st metatarsal. 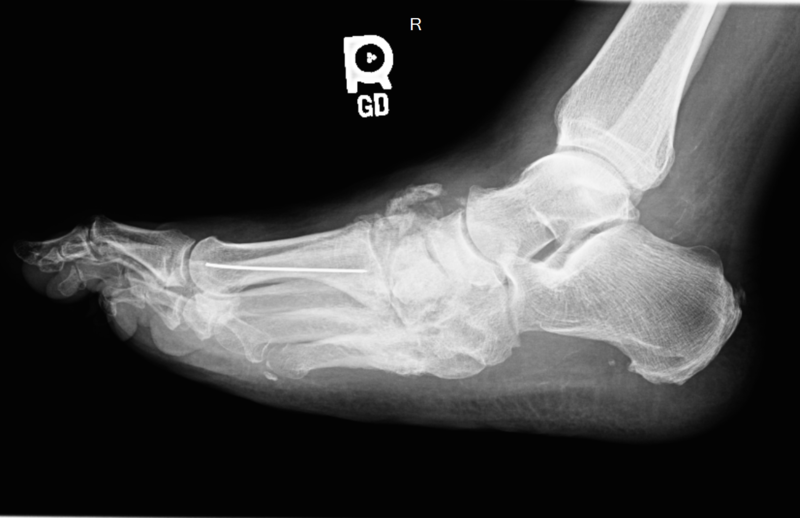 Figure 4 Left: Postoperative radiographs showing forefoot valgus correction. Right: Preoperative radiographs showing forefoot valgus deformity. 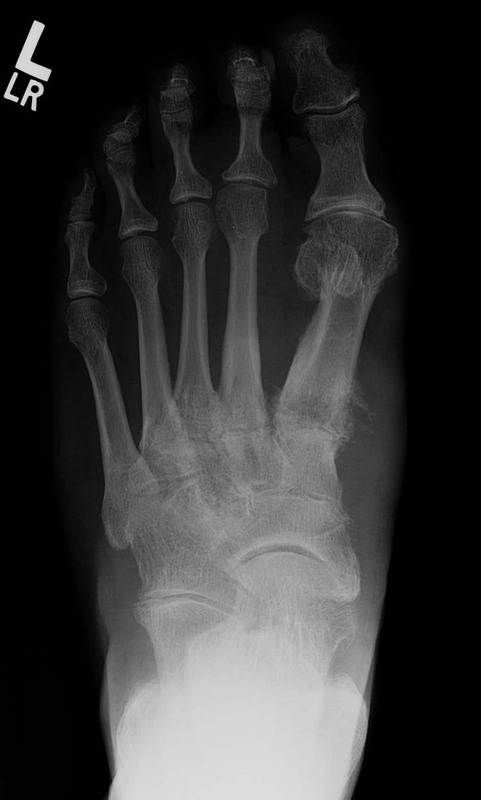 This case presents a patient with a complex deformity in which chronic ulceration is due to a hyper-mobile first ray combined with a previously shortened 1st metatarsal. 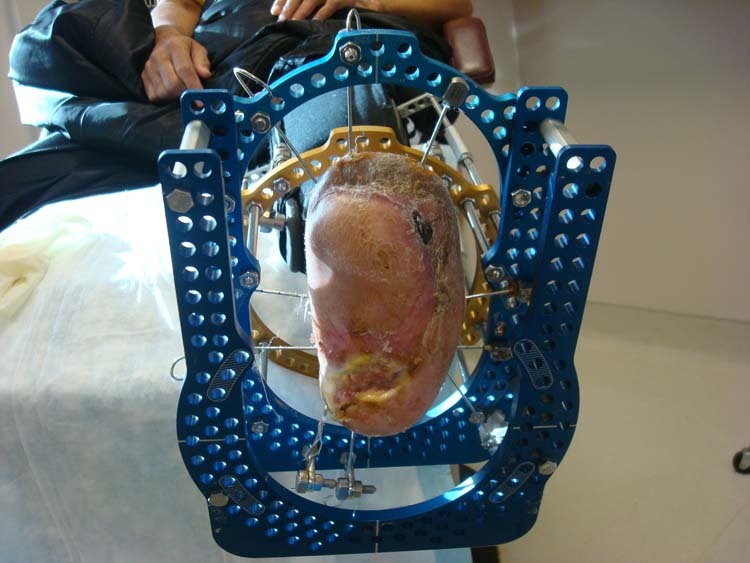 Prior studies have shown the effectiveness of external fixator use1, as well as medial column arthrodesis, in the management of patients with Charcot neuroarthopathy. By combining these two previous treatment modalities with extension of the 1st metatarsal, through the usage of an autologous bone graft, a stable plantar grade foot can be achieved (Fig. 5). 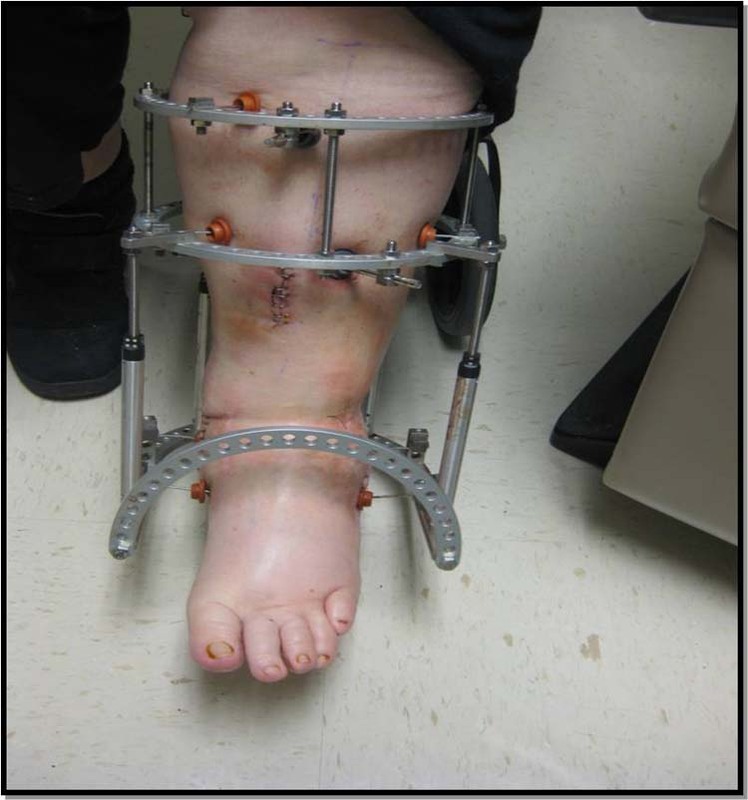 Below knee amputation is often the recommend procedure in Charcot joint disease patients with chronic non-healing ulceration and significant deformity. 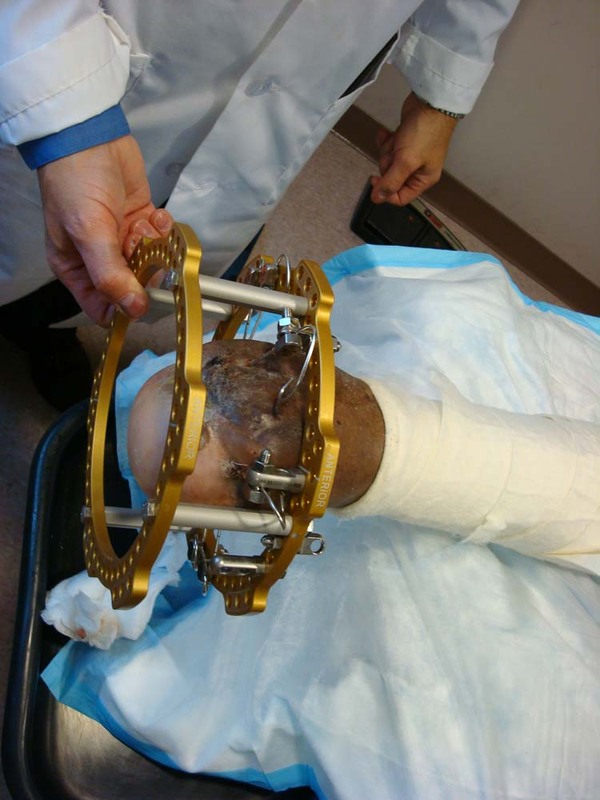 The successful utilization of acute tri-planar correction, external fixation and autologous bone graft provides an alternative treatment for those patients with complex Charcot foot deformities. 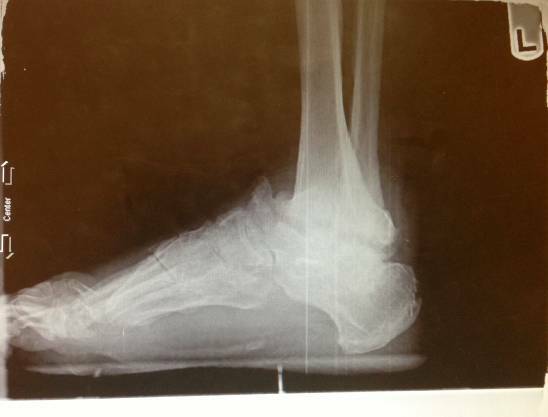 Figure 5 Left: Postoperative stable plantar grade L-foot free of ulceration. 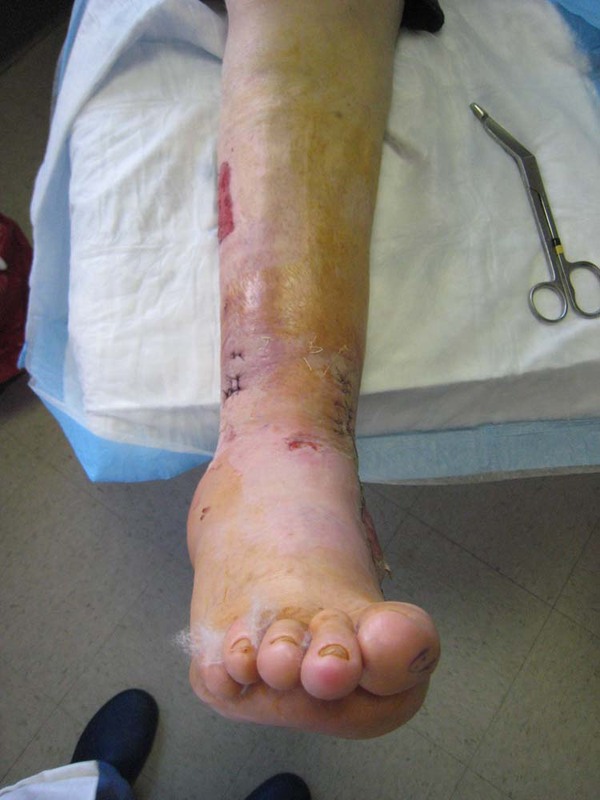 Right: Preoperative unstable L-foot with ulceration. 3. Zgonis T, Stapleton J, Roukis T. Charcot Foot and Ankle Deformity. McGlamry’s Comprehensive Textbook of Foot and Ankle Surgery. 4th ed, Ch 70. 1008-1021. 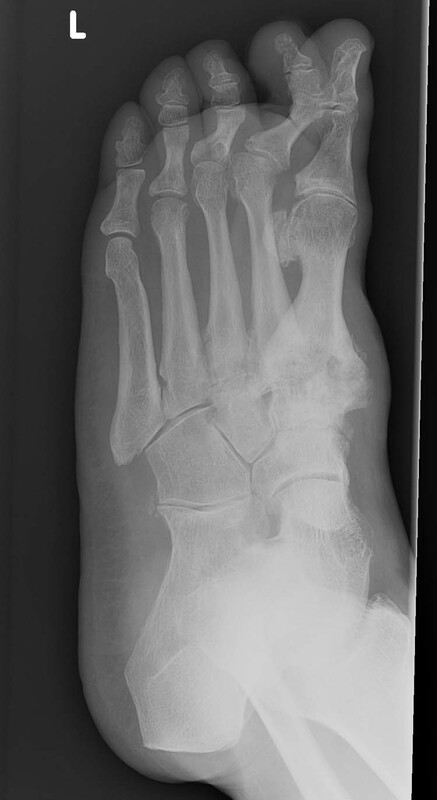 A case report discusses the presentation, diagnosis and treatment of a 45 year old diabetic man with a divergent, Lisfranc’s dislocation of the first metatarsal in a Charcot foot. 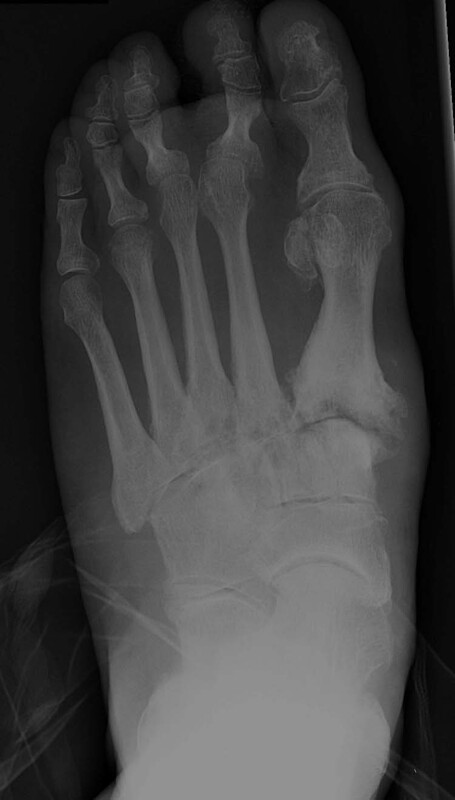 The patient also presents with associated laterally subluxed lesser metatarsals and multiple fractures. 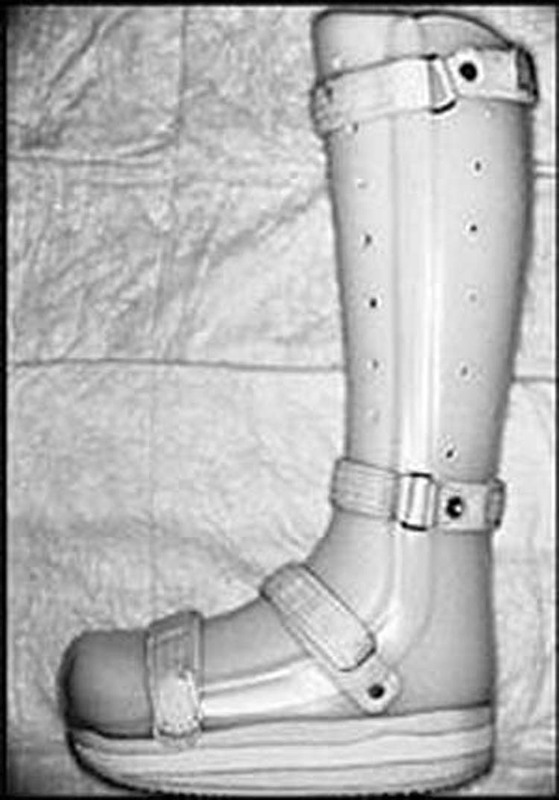 Conservative treatments such as TTC or total contact casting, prefabricated pneumatic walking brace (PPWB), patellar-tendon brace and CROW custom orthosis are discussed. Charcot joint in the foot typically refers to painless fracture and dislocation of the foot in patients without normal sensation or feeling in their foot. 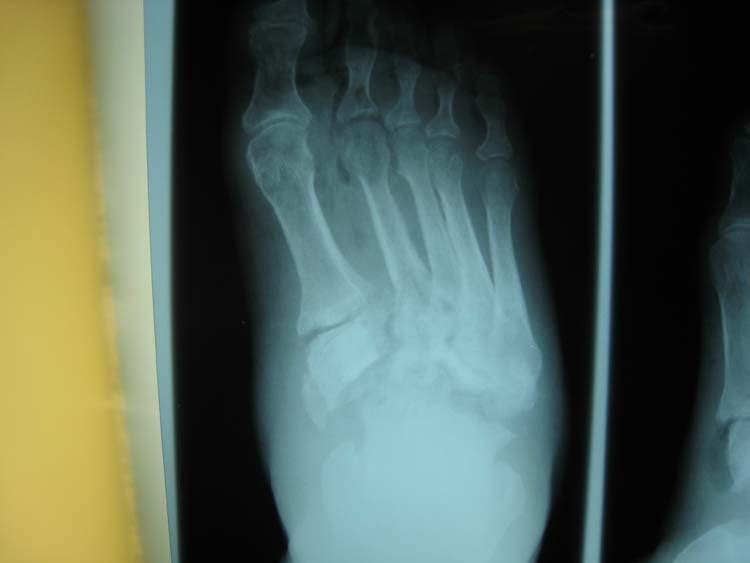 Loss of sensation in the foot for any reason can be responsible for developing a Charcot fracture, although this is most commonly seen with neuropathy. Neuropathy of the nerves that affect the foot is most commonly seen with diabetes, but is associated with other diseases as well. Treatment depends on the severity of the condition and the amount of deformity that is present. 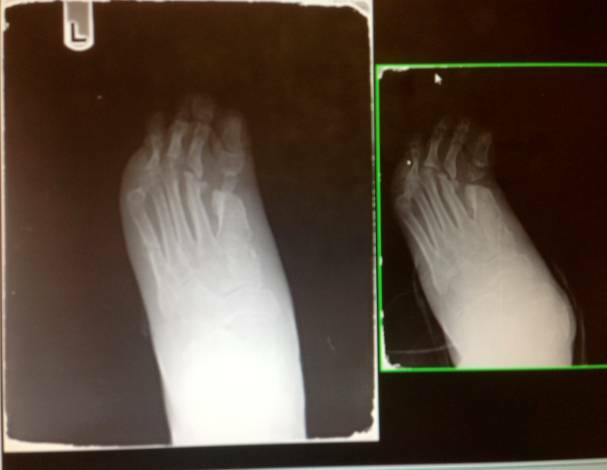 We present a 45 year old diabetic man with Lisfranc’s dislocations along with fracture of 2,3,4,5 metatarsals. These patients frequently present complaining of a deep, aching, non-descript pain in the ankle joint that worsens with activity. 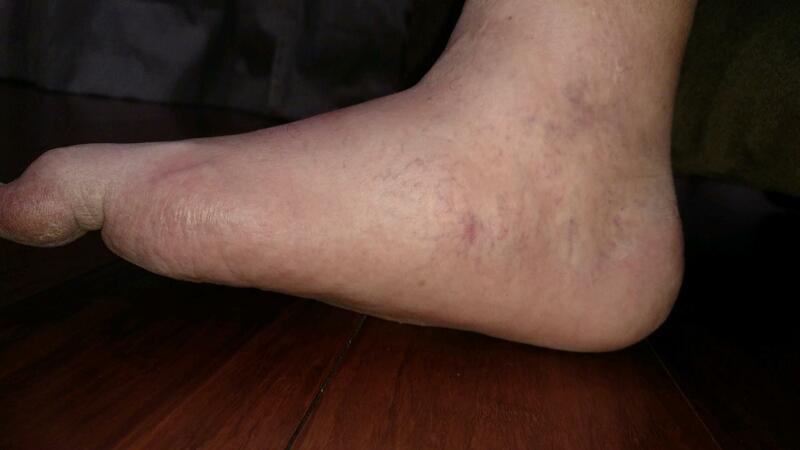 Figure 1 Diffuse swelling is noted to the left foot in a typical, Charcot presentation. The swelling is diffuse and non-painful. 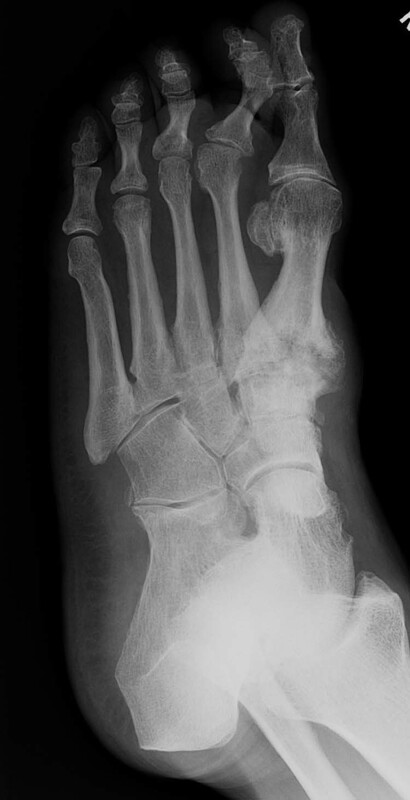 Figure 2 Oblique views reveal a divergent, Lisfranc dislocation of the first metatarsal with associated lesser metatarsal fractures. 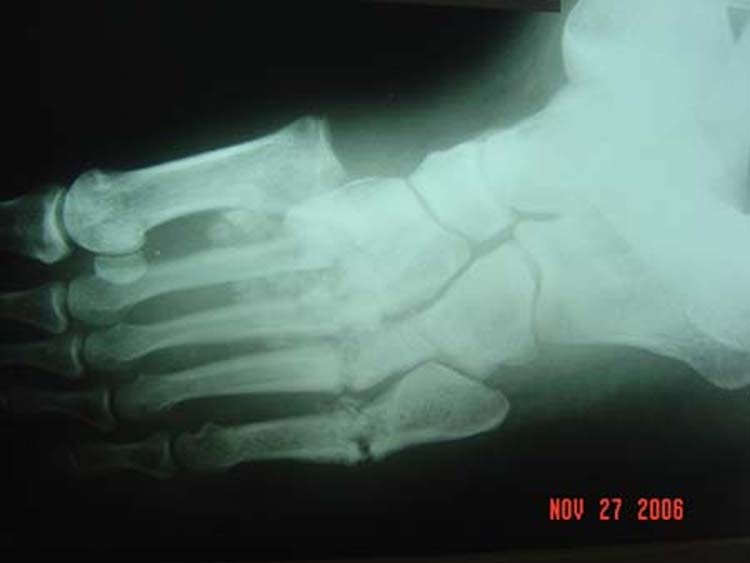 Figure 3 Dorsoplantar view reveals complete dislocation of the first metatarsal at the medial cuneiform articulation. Typical TMT joint fracture, fragmentation, joint subluxation and bone remodeling is seen. Random blood sugar was 201mg/dl. C-reactive protein was negative; Erythrocyte sedimentation rate was 12mm/hr. Other blood parameters were normal. The patient was treated with a total contact cast. Casts were replaced approximately every 2 weeks. The foot was inspected, and cutaneous temperature measurements were done. Serial plain radiographs were taken approximately every month. Casting lasted for 3 months. 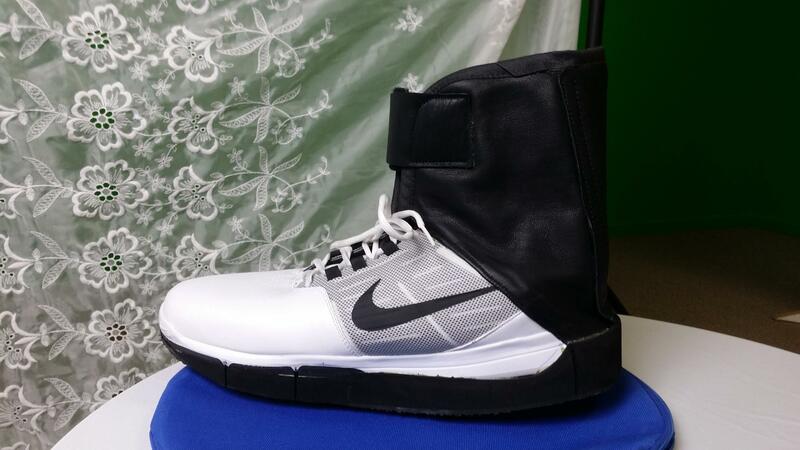 We used a patellar tendon¬ bearing brace in addition to custom-molded footwear after the cast. The brace was eliminated from the regimen after six months. Thereafter, continued use of custom footwear to protect and support the foot was given. The process is characterized by pathologic fractures with an exuberant repair mechanism and is associated with mixed peripheral neuropathies. The common denominator in these various conditions is that motor function is not as severely affected as are sensory modalities in the patient. [3,4,5] The Charcot foot in the diabetic patient is a progressive condition that is not confined to bones but affects all of the tissues in the lower extremity. 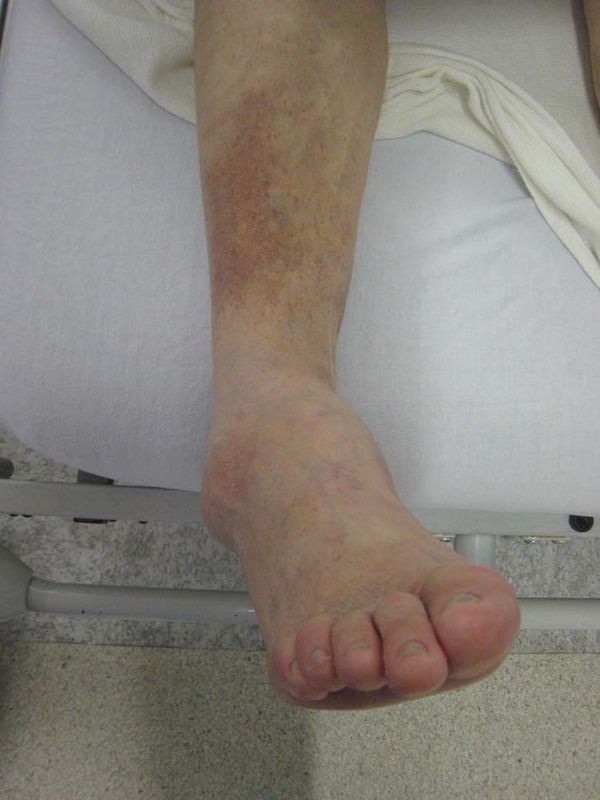 It is often confused with osteomyelitis and massive infection of the foot necessitating early identification and management to prevent amputation of the lower extremity. With the advent of advanced surgical techniques and a better understanding, the physician may be optimistic with the treatment of this condition. By thoroughly understanding the etiologic factors and deforming forces, treatment can be planned for each specific patient. The neurotraumatic theory attributes bony destruction to the loss of pain sensation and proprioception combined with repetitive and mechanical trauma to the foot. The neurovascular theory suggests that joint destruction is secondary to an autonomically stimulated vascular reflex that causes hyperemia and periarticular osteopenia with contributory trauma. Intrinsic muscle imbalance with increased heel and plantar forces can produce eccentric loading of the foot, propagating microfractures, ligament laxity and progression to bony destruction. Neuropathic arthropathy is prevalent in 0.8 to 7.5 percent of diabetic patients with neuropathy; 9 to 35 percent of these affected patients have bilateral involvement. [7,8] The higher prevalence is seen in referral-based practices. Most patients with neuropathic arthropathy have had poorly controlled diabetes mellitus for 15 to 20 years. Clinical findings in patients with an acute Charcot process include warmth, erythema and swelling. [13,14,15] Pain and tenderness are usually absent because of sensory neuropathy, which is universal and is probably a component of the basic pathogenesis of the Charcot foot. Cellulitis should be considered in any patient with diabetes. Missing the diagnosis of Charcot foot can be disastrous since failure to initiate proper treatment of the Charcot foot exacerbates the problem. We strongly recommend that the diagnosis of acute Charcot foot be considered in any patient with diabetes and unilateral swelling of the lower extremity and/or foot. The existence of little or no pain can often mislead the patient and the physician. 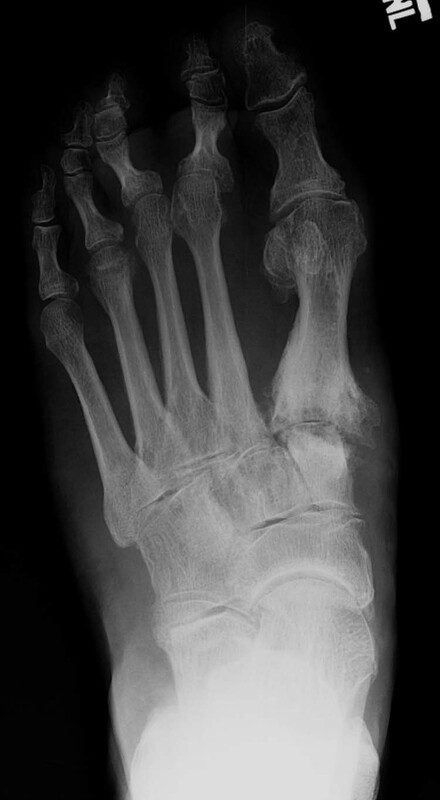 The tarsometatarsal (Lisfranc’s) joint is the most common site for arthropathy, with initial involvement usually occurring on the medial column of the foot. The distribution of neuropathic arthropathy is 70 percent at the midfoot and 15 percent at the forefoot or rearfoot; it is usually contained in one area. Bony destruction, fragmentation, joint subluxation and bony remodeling are considered radiographic hallmarks of the disease. These radiographic changes take time to develop, however, and may be absent at the time of presentation. 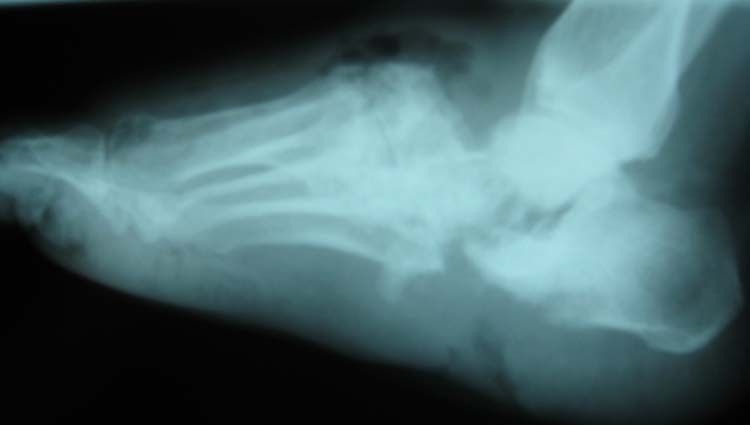 The initial radiographic findings can be normal, making the diagnosis difficult but, if a Charcot foot is strongly suspected from the clinical presentation, treatment should be initiated and serial radiographs should be taken. Biopsy is the definitive test for the diagnosis of Charcot joints. The specimen will demonstrate the presence of multiple shards of bone and cartilage embedded within the deeper layers of the synovium. If osteomyelitis is of concern then a bone biopsy is essential for proper and accurate diagnosis. 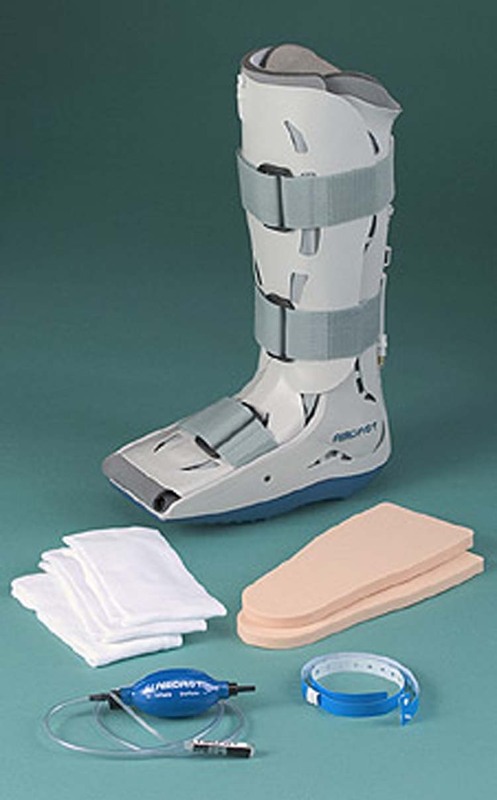 Figure 4 Total Contact Cast is used for immobilization and protection of the Charcot foot. It is commonly used as initial conservative treatment in the acute Charcot episode. Charcot fractures that are not treated progressively, typically lead to marked deformity and skin ulceration over the new bony prominence. 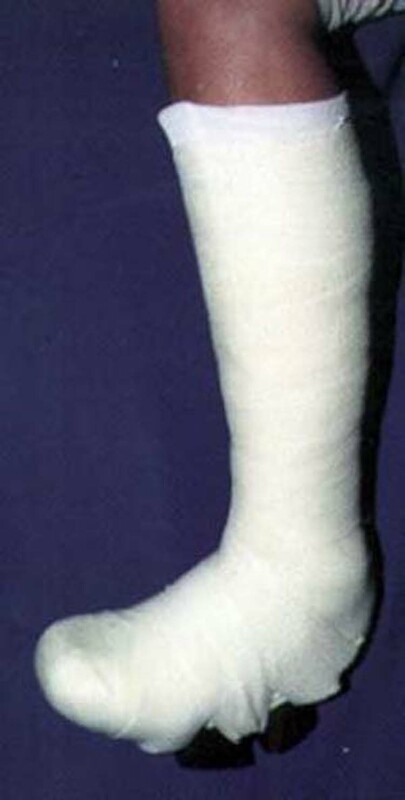 Casts should be replaced approximately every one to two weeks. 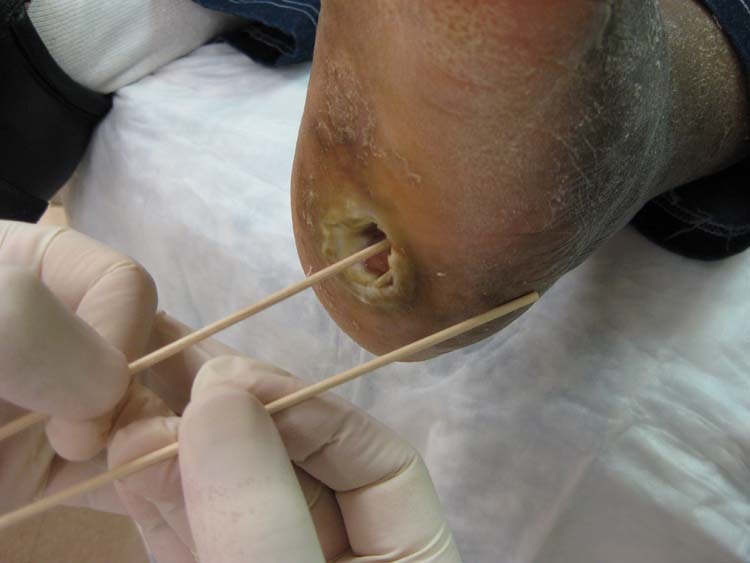 The foot should be inspected, and cutaneous temperature measurements should be made. Serial plain radiographs should be taken approximately every month during the acute phase. 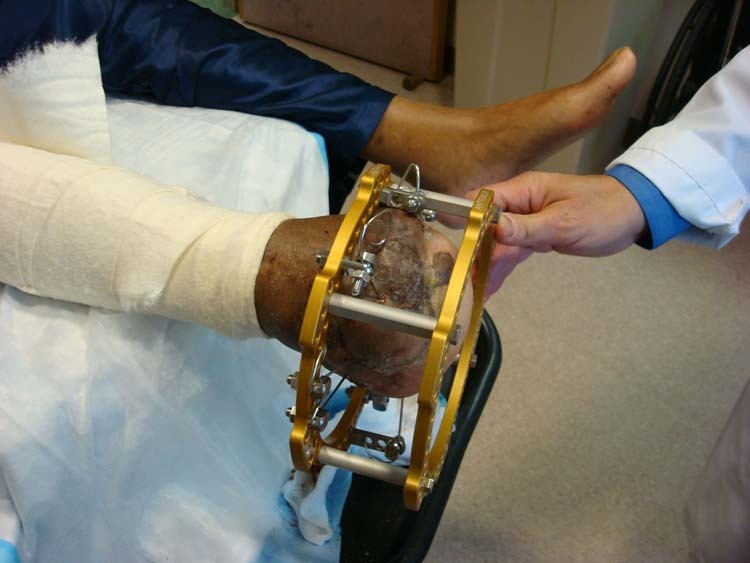 Casts should be kept on until the active phase of the Charcot process is complete, as evidenced by temperature normalization and radiographic stability. Casting usually lasts from three to six months. 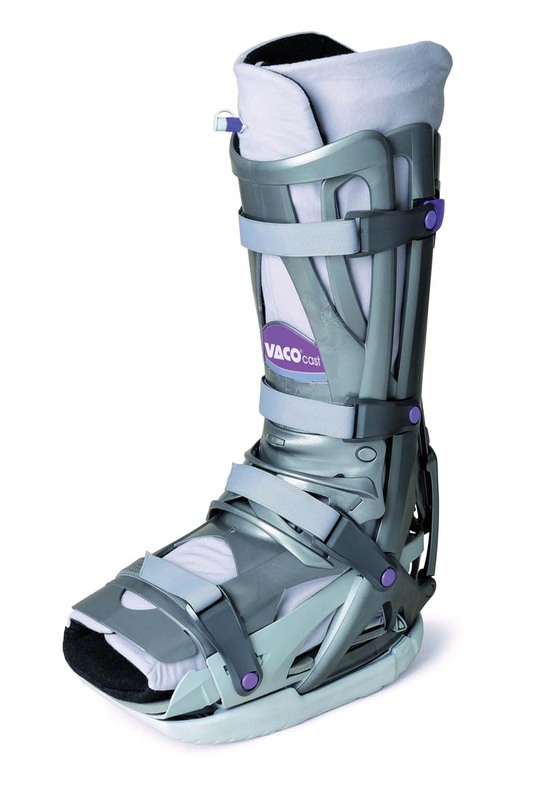 The initial post-cast phase usually includes the use of some sort of a brace to protect the foot. 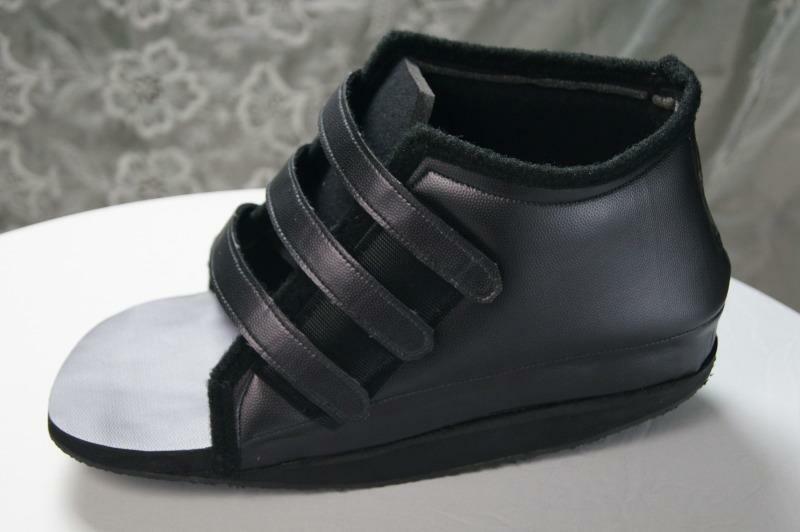 We used a patellar tendon¬ bearing brace in addition to custom-molded footwear. 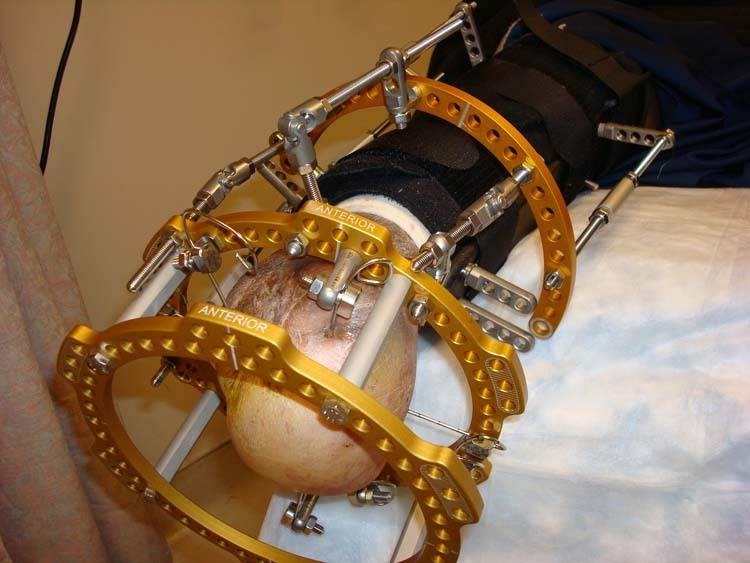 The brace can sometimes be eliminated from the regimen after six to 24 months. Thereafter, continued use of custom footwear to protect and support the foot is essential. Benefits include easier wound surveillance, ease of application and the ability to use several types of dressings. 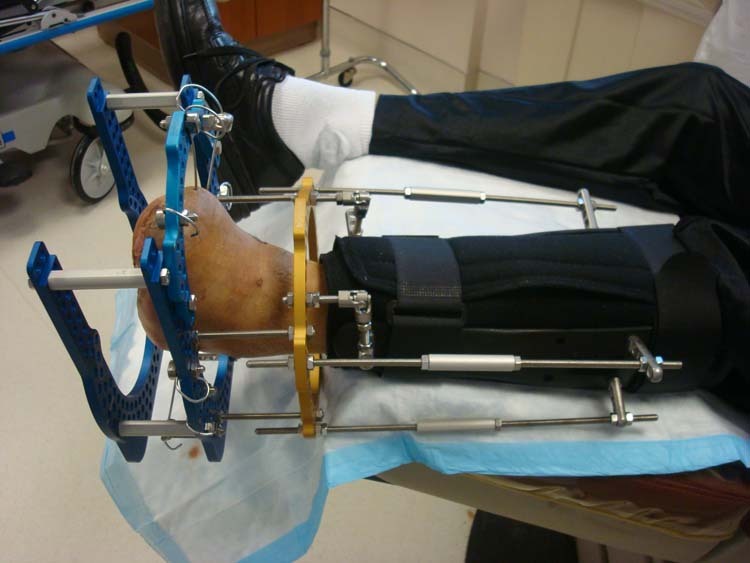 Use of the PPWB is limited in patients who have severe foot deformity or who are noncompliant. 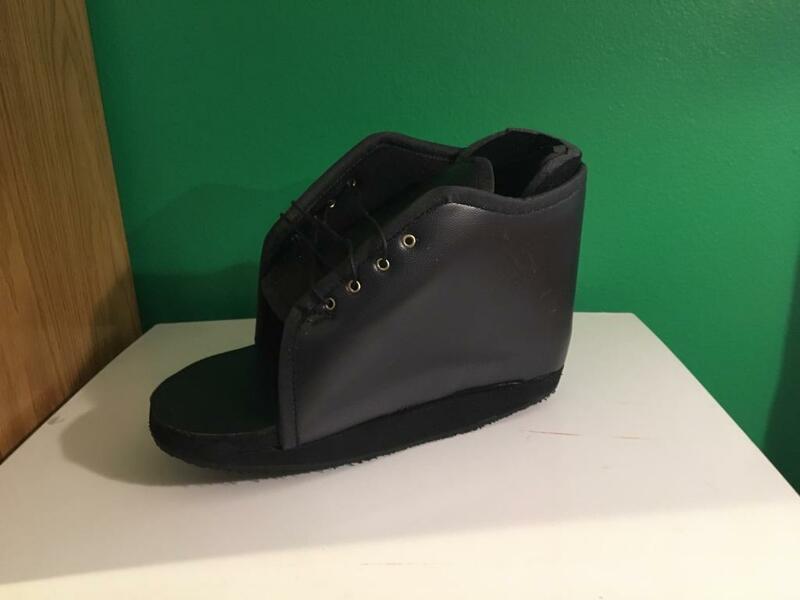 After swelling and erythema resolve and radiographic stability has been achieved, the TCC can be changed to a CROW, an ankle foot orthosis or a patellar tendon-bearing brace, depending on residual anterior edema. If anterior edema persists, the CROW full-enclosure system is used. (Fig. 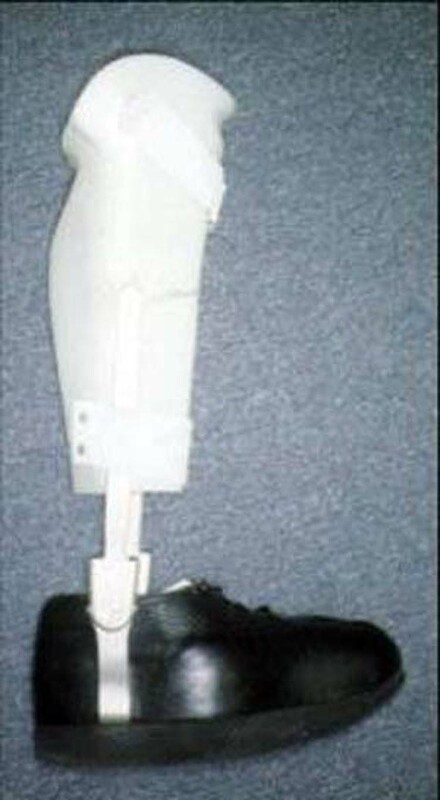 6) This device is used for six months to two years, until a stable foot is obtained. Patients can then be fitted for extra-depth shoes with custom insoles or orthotics to accommodate any residual deformity. 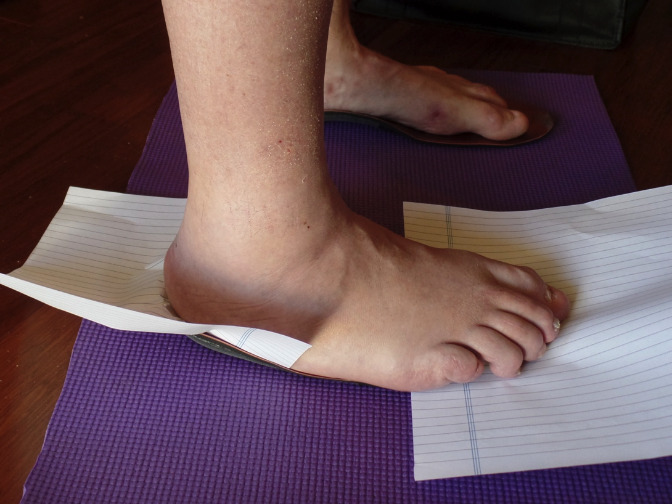 Return to conventional foot gear may not be possible in all cases. Other treatments for the Charcot process have included electrical bone stimulation or low-intensity ultrasonography during the acute phase to enhance healing. [11,12] Another study found that use of a bisphosphonate (pamidronate) resulted in decreased erythema, decreased temperature and decreased Charcot activity. [12,13,14] Additional controlled studies are needed to further evaluate the effectiveness of these treatments. While it is still unknown why some patients with diabetes develop a Charcot process and others do not and more interestingly why some patients only develop this condition in one of their feet, an introspective review is necessary. The literature on Charcot foot is huge and refers, not specifically, to every joint and metatarsals. The fact that 2,3,4,5 metatarsal involvement has not been extensively described, does contribute a base for our observation. In summary, the Charcot foot commonly goes unrecognized, particularly in the acute phase, until severe complications occur. 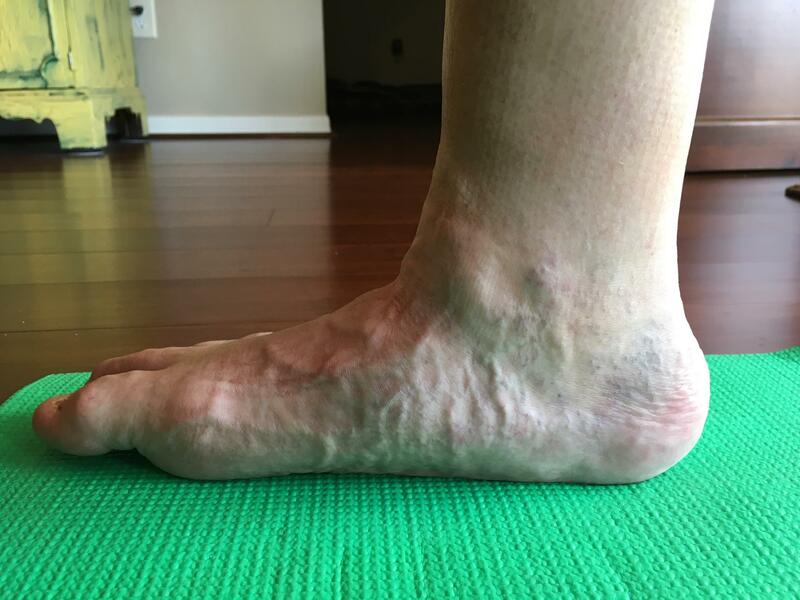 Early recognition and diagnosis, immediate immobilization and a lifelong program of preventive care can minimize the morbidity associated with this potentially devastating complication of diabetic neuropathy. 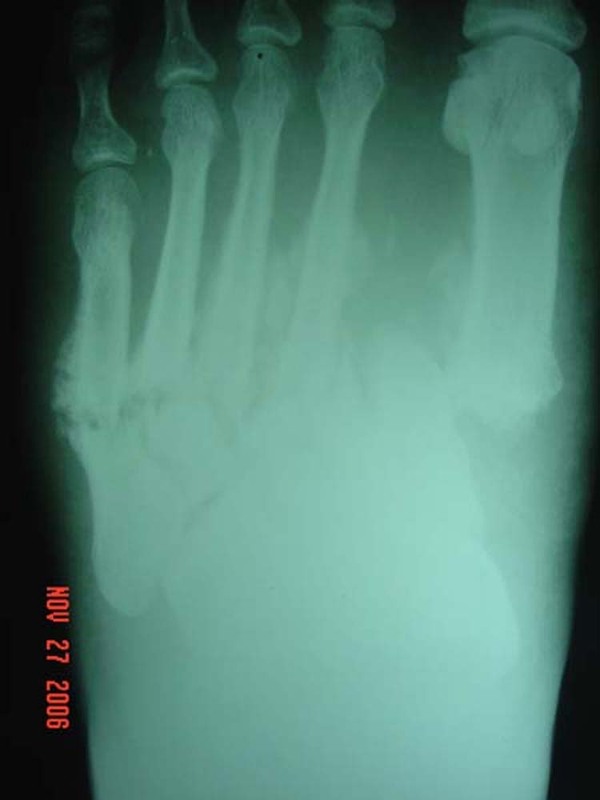 If unrecognized or improperly managed, the Charcot foot can have disastrous consequences, including amputation. A lifelong program of patient education, protective footwear and routine foot care is required to prevent complications such as foot ulceration. With proper planning, timing and knowledge of all facets of diabetic neuropathy, many patients may retain their foot and benefit from its function. 2. Cavanagh PR, Young MJ, Adams JE, Vickers KL, Boulton AJ. Radiographic abnormalities in the feet of patients with diabetic neuropathy. Diabetes Care 17:201-9, 1994. 3. Johnson JTH: Neuropathic fractures and joint injuries J Bone Joint Surg 49A: 1, 1967.
joint: neurotraumatic vs neurovascular. Radiology 139: 349, 1981. 5. Banks AS, McGlamry ED: Charcot Foot. J Am Pod Med Assoc. 79: 5, 1989. 6. Schon LC, Easley ME, Weinfeld SB. Charcot neuroarthropathy of the foot and ankle. Clin Orthop 349:116-31, 1998. 7. Armstrong DG, Todd WF, Lavery LA, Harkless LB, Bushman TR. The natural history of acute Charcot’s arthropathy in the diabetic foot specialty clinic. Diabet Med 14: 357-63, 1997. 8. Harrelson JM. The diabetic foot: Charcot arthropathy. Instr Course Lect 42:141-6, 1993. 9. Eichenholtz SN. Charcot joints. Springfield, Ill.: Thomas, 1966. 10. Kelikian AS. Operative treatment of the foot and ankle. Stamford, Conn.: Appleton & Lange, 153, 1999. 11. Caputo GM, Ulbrecht J, Cavanagh PR, Juliano P. The Charcot foot in diabetes: six key points. Am Fam Physician 57:2705-10, 1998. 12. Brodsky JW. The diabetic foot. In: Mann RA, Coughlin MJ, eds. Surgery of the foot and ankle. 6th ed. St. Louis: Mosby, 1993. 13. Giurini JM, Chrzan JS, Gibbons GW, Habershaw GM. 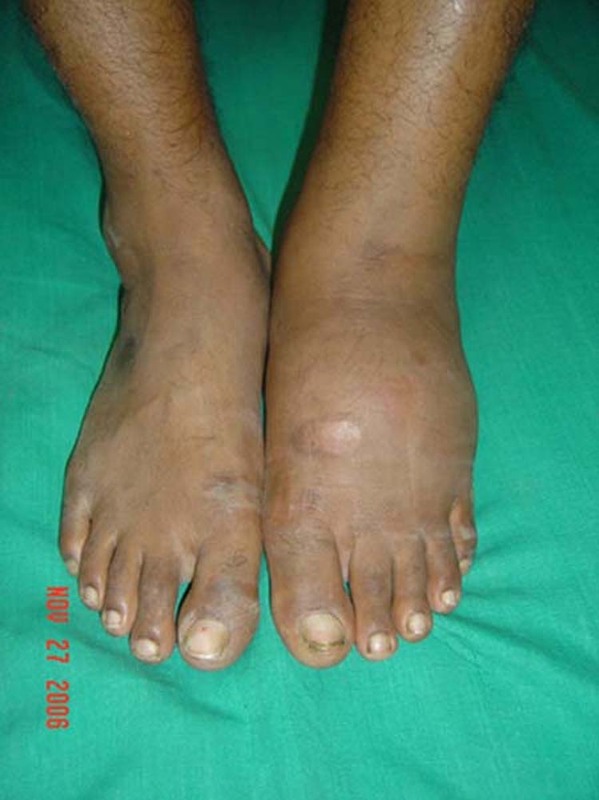 Charcot’s disease in diabetic patients. Correct diagnosis can prevent progressive deformity. Postgrad Med 89(4):163-9, 1991. 14. Holmes GB Jr, Hill N. Fractures and dislocations of the foot and ankle in diabetics associated with Charcot joint changes. Foot Ankle Int 15:182-5, 1994. 15. 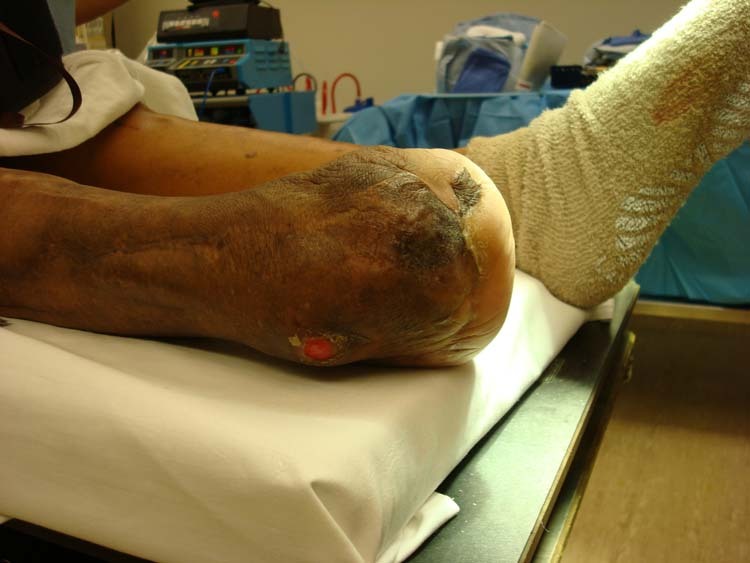 Sinha J, Thomas EM, Foster A, Edmonds M. Fractures in the neuropathic diabetic foot. Foot 4:28-30, 1994. 16. Pupp, G., Wilusz, P.M. Reassessing The Impact of Diabetic Footwear. Podiatry Today, online article. ISSN: 1045-7860 – 17:3, March 2004. 1Registrar in Orthopedics, Department of Orthopedics, St. Stephens Hospital, Tiz Hazari, Delhi, India.